With increasing frequency I have been asked by friends and well-wishers about how “anti-vaxxers” are being broached by my medical school professors. Simply put, we aren’t being taught anything on the matter. This is insight on how future physicians are being groomed to handle public misinformation and media outcry. Obviously we are given the molecular biology and public health angles as to how vaccinations work from the micro to macro scale, but we aren’t supplied with the tools on how to discuss these seemingly controversial topics with our patients. This could be for a few reasons. First, the rising trend in vaccination refusals and recent measles outbreak, coupled with subsequent media hysteria, will raise awareness of the harm of not vaccinating children—and this trend will correct itself. After all, it seems affluent Millennials are seeing the greatest raise in foregoing vaccinations. They understand that chemicals are pervasive in today’s world, and while they might not buy that vaccines cause autism, they certainly don’t believe that injecting children with man-made concoctions at an early age increases their biological fitness. Therefore, when the educated anti-vaxxers see the harm they may be causing society as a whole, let alone their own kids, the trend will inevitably correct itself. One would hope. It isn’t only the Millennials; some of the unvaccinated come from isolated religious communities, and the poorer counties within a state tend to have lower levels of vaccination rates. Each patient is unique and asks questions regarding vaccinations with different levels of background knowledge. Therefore different ways to convey the same message about the effectiveness of vaccines would need to be employed by the physician. This is a technique developed more during third and fourth year of med school (I’m still in my second year which is primarily classroom-based) so maybe it is more appropriate to have these discussions later in schooling. Sometimes a patient’s anecdotal evidence (e.g. “My friend’s sister had a normal child until they got vaccinated and then the child became autistic”) is too ingrained and no amount of sound evidence can dissuade them from their preset justification. My school might just be trying to allow its students to form their own ways of picking and choosing their battles when it comes to handling these issues with the patients. Lastly, perhaps doctors feel that by and large they are above the entire “debate” about whether vaccinations are good or bad. Let the 24-hour news cycle run its course. Football just ended, it’s too early for 2016 elections, Russia and Ukraine’s ceasefire is mildly interesting, and by national news standards there’s not really much going on besides the latest ISIS comings and goings. By physicians engaging in a discussion about the merits of vaccinating your kids, it may lend credence to the extreme minority’s position as a legitimate conversation starter. Last year, noted scientist Bill Nye entered a debate with noted Amish-look-alike Young Earth Creationist (YEC) Ken Ham on whether creationism and a 6,000-year-old Earth is a viable model for our origin. Many people felt that Nye showing up to the debate was essentially giving YECs publicity and a form of legitimization, even though they are an extremely small and vocal minority without the backing of any evidence or scientific merit—much like the anti-vaxxers. The biggest difference being that someone believing Earth is 6,000 years old won’t necessarily raise the chance that my child gets a debilitating illness. As far as med school teaching is concerned, we are urged to strongly recommend for vaccinations for inquiring patients, but maybe we should also be discussing issues on a larger scale and how it relates to public health. Although we have a bioethics course, which excels at giving students the facts regarding the law and why and how the law was passed, we are never given the tools for how to make more permanent change in the community. We are not instructed on how to engage in ethical discussions about whether or not something like vaccinations should be mandated by the government. In the last decade there have been failed or short-lived attempts at making HPV vaccinations mandatory throughout the U.S. The issue has been up for legislation in nearly half of the states and has failed in all but Virginia and D.C. (it was passed and later repealed in Texas). Perhaps not surprisingly, people would prefer to have the opportunity to make the wrong decision rather than having the right decision forced upon them. I believe that people are very much products of their environment and will naturally gravitate towards the path of least resistance. Change on a macroscopic scale, like how society views public health mandates, can be unnecessarily slow to develop, except in rare cases like the polio vaccine—which was almost literally an overnight sensation. If many of the medical aspects of how we treat our bodies are dealt with in an “opt out” fashion I believe that we may see a significant increase in the quality of life across all strata of society. A great example of this is Spain’s organ donation rates. They have the highest rates of organ donation on the planet primarily due the country’s policy that each individual is automatically enrolled as an organ donor. If you want your organs to stay in your body to take them with you to heaven (or hell) after you die, you would have to fill out some paperwork. Well guess what? People generally find paperwork to be a nuisance and a tedious endeavor. You want me to fill out these forms just to be able to fill out more forms like we’re in some bureaucratic Soviet state? I’d rather just let you have my organs. And that is the idea: create a society in which it is commonplace for people to generously donate their unneeded organs and they will eventually do so, not because it is the path of least resistance because it is the right thing to do to save other people’s lives. I envision after years or perhaps generations with a certain policy in place (like having to opt out of donating blood) that when the opt out policy is removed people still donate at the same rate because donating blood is something that people should feel compelled to do to help their fellow man. In the meantime, don’t incentivize performing a positive action, simply tack on some form of negative reinforcement to make a negative action (such as not donating blood or organs) more difficult. This way only those who have a true objection to the task will take these necessary steps. In all likelihood there is no formal teaching for medical students on how to deal with anti-vaxxers in our pre-clinical years because it may not come up in doctors offices as much as the cable news-watching public may think. According to the CDC, vaccination rates have only had a very modest dip over the past decade and it should be far down the list of concerns doctors have for their patients. Some combination of it being a trendy topic, each patient’s situation being unique, and that it’s just beneath us as physicians to discuss, is what’s most likely being employed by our professors. There is already so much packed in our ever-expanding curriculum that we simply might not have time to really delve into the issues surrounding medical trends. Plus, by the time I actually become a doctor seeing my own patients, the medical landscape could be so vastly different that people questioning vaccinations would be a relic of a bygone era. A few days ago, Buzzfeed reported that Staples, the large office supply chain, had stepped up its enforcement of a cap on hours worked for part-time employees. Despite the company’s unconvincing claim* that the policy is longstanding, it appears that Staples implemented the 25-hour-per-week cap in January of 2014 “to skirt impending rules requiring companies to provide health insurance” to employees who work at least 30 hours a week. Staples’ original memo to store managers, as published by Buzzfeed. Staples’ decision will undoubtedly renew arguments that the Affordable Care Act’s (ACA’s) employer mandate – the provision that requires companies with more than 50 full-time workers to insure employees who work at least 30 hours each week – has led to harmful effects on work. These arguments, like parallel narratives about minimum wage laws and paid sick leave ordinances, are largely inaccurate, and advocates of evidence-based, power-balancing policy are absolutely right to debunk them. However, we cede too much when, as is often the case, we default to a defensive stance. “Yes, the negative incentive is there, but the data show such effects to be small or non-existent” should not be the full scope of our response. Opponents of an employer mandate, minimum wage, and paid sick leave want people to focus on what employers will do in response to each policy’s enactment. The more relevant question, however, is about what employers can do. First, it’s important to remember that businesses can deduct employer-provided benefits from their tax bills, and that the employer contribution to health benefits is widely viewed as coming out of worker salaries. Providing employees with health coverage, decent wages, and paid sick leave costs less money than a lot of people think, though it’s certainly more expensive than offering meager wages and no benefits. In the most recent quarter for which financial information is available, August through October of 2014, Staples made $216 million in after-tax profits. Their CEO, Ronald Sargeant, made over $10 million in total compensation in 2013, while other top executives raked in well over $2 million apiece. Barack Obama didn’t have those numbers when he was asked about Staples’ policy a few days ago, but his suspicion “that [Staples] could well afford to treat their workers favorably and give them some basic financial security” was clearly right on the money. The ACA didn’t make Staples cut its employees’ part-time hours; instead, Staples management consciously chose to prioritize a fifth car or third house for a few wealthy individuals over its part-time workers’ ability to put food on the table. Other large companies, from Starbucks to McDonald’s to Walmart, make similar callous choices on a range of issues all the time. There are two ways to address this problem. The main mechanism currently at our disposal is to loudly call such decision-making what it is – greedy and unethical – and vote with our dollars for companies that treat their workers fairly. Opponents of labor standards focus on what businesses will do rather than what they can do in part because we let them avoid moral reckoning. We won’t win everyone over, but we must not underestimate the power that moral authority has to shape behavior. The second mechanism is policy that addresses firms’ decision-making. Some recent legislative proposals, in fact, like Congressman Chris Van Hollen’s CEO-Employee Fairness Act, have the potential to begin to wade into these sorts of waters. If we’re worried that companies will choose to lay people off in response to a minimum wage increase, for example, we could raise taxes on the executives of companies that make this choice. No matter the policy outcomes, it’s essential that we ask the right questions in these debates. It’s worthwhile and important to document the evidence that policies like the employer mandate, minimum wage, and paid sick leave have minimal consequences on work. But it’s also essential to point out that any consequences these policies do have aren’t inevitable. 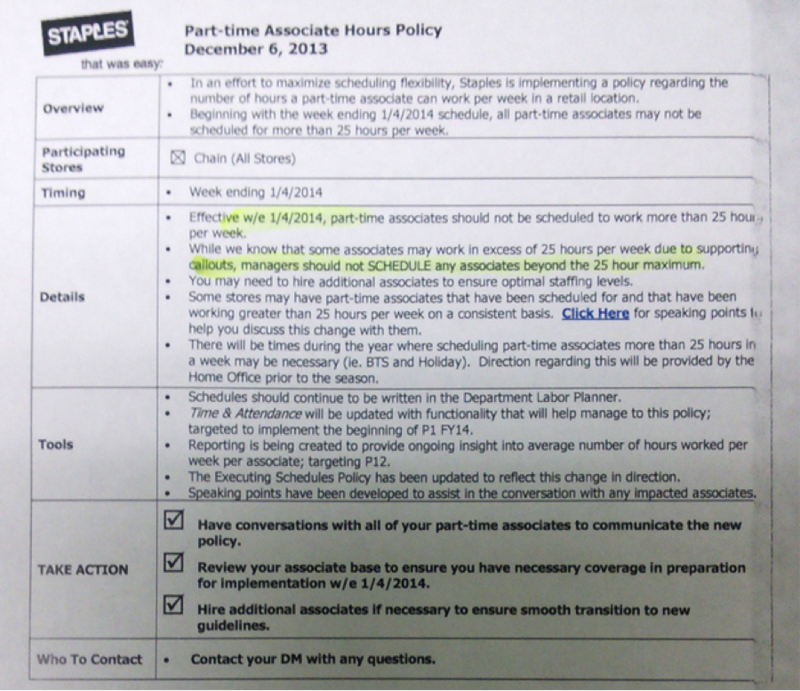 *As Buzzfeed’s original coverage explained, Staples claims that their part-time hours policy has been in effect for over ten years, and that the memo Buzzfeed obtained only “reiterated the policy.” Yet the memo contained phrases like, “Beginning with the week ending 1/4/2014,” and “Staples is implementing a policy.” A Staples spokesperson did not respond to follow-up questions about the memo’s language. **It’s possible, though I’ve never seen a study to prove it, that some businesses actually can’t afford to adequately compensate their workers, that they’re barely squeaking by as is with low executive salaries, non-existent profits, and the highest level of productivity they can possibly attain. To the extent these businesses exist – and I’m skeptical that many of them do – it’s worth asking whether a business’s right to keep its doors open should trump its workers’ right to make enough to provide for their families. I don’t believe it should. Note: A version of this post appeared in The Huffington Post on February 16.